I met up with Stacie and Darik at the gorgeous Oregon Garden in for their engagement photoshoot and it was a beautiful evening making the day even more special. Stacie and Darik are a sweet, kind and fun couple. I loved the fall colors and we had a blast adventuring around the gardens and finding ponds, meadows, ponds and a hobbit house (for real! ).They are getting married in Salem, Oregon later this month and we are very excited for their winter wedding! Amanda and Lane’s wedding was nothing short of magical. I have known Amanda for over three years and in that time she has become the amazing studio manager and a photographer for my studio, A Lovely Day Photography! I had the pleasure of getting to know Lane during their vintage RV engagement session earlier this spring and was excited & honored to photograph their stylish Union Pine wedding in the fall. The couple looked absolutely stunning: Amanda was styled in a dress from a & b Bridal Shop Portland and Kirstie Wight Makeup created her hair and makeup look. Lane wore a great tux from Danielli Menswear. The incredible flowers were designed by the talented Brenna Burnett Florals and the exposed cake was done by none other than the team at Dreamcakes. Please check out the very cool video that the killer team at Glitch made as well! The whole day could not have been more perfectly “Amanda and Lane” with all of the unique personalized touches such as the hand made benches made by Lane and his dad that the guests sat on personalized cocktails and s’mores! Cindy with Peachykeen Coordination helped to keep everything on schedule and planned perfectly! Walking down the aisle was Amanda’s favorite part of the day, “I thought I would cry, but I was overcome with happiness in the form of laughter. I laughed all the way down the aisle! These are also some of my favorite photos from the day. I love the look on my dad’s face as he sees my joy”. This was an awe-inspiring and very fun wedding celebrating the love of these two stylish and smart people and I’m so happy for them! Ahhh! I couldn’t be happier for this wonderful family! After photographing Elizabeth and Tim’s amazing engagement & wedding several years ago, I was honored to photograph their stylish and joyful maternity session at the historic Lewis and Clark campus. Photographing a family’s milestones in this wonderful life is why I do what I do! Tim and Elizabeth are just as kind and wonderful as they appear and we had lots of laughs and long the way. Also, can we just mention their adorable pup, Penny? She stole the show with several people stopping us to pet her and give her love! Very excited for them to welcome their baby boy later this month! Eeeeek! 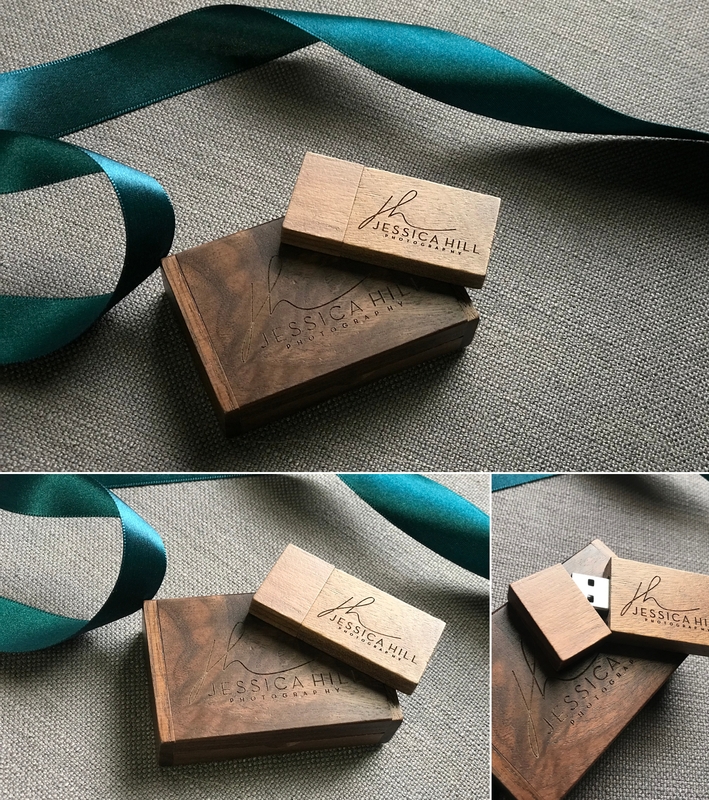 I am so excited to be partnering with USB Memory Direct to provide wooden hard-drives to all of my couples with their digital wedding photographs. These drives are USB 3.0 meaning that they are fast and reliable…two of my favorite things! Although, I strongly believe in the beauty of printed photos for custom wall art or albums; it is so wonderful to have all of your wedding photos in one place on the drive. Thank you USB Memory Direct for these beautiful drives. After meeting Taylor at the iconic Heathman restaurant (she trained me to be a hostess there while I started this amazing biz back in 2007!) and photographing her and David’s iconic Cannon Beach engagement session; I knew their wedding would be truly momentous. We started with some organic and chill getting ready photos with the couple before the best man and maid of honor revealed the beautiful Taylor via their vintage pocket doors. Her gorgeous hair and makeup by the talented Kirstie Wight. Their wedding was a collaboration of friends and family, from their friend Sarah who created the very impressive florals to Annie who took on the important day-of coordinator role! Lan Su Chinese Garden Weddings might be some of my absolute faves, with its impressive architecture, lush gardens, bridges and hidden nooks. The emotional ceremony took place after sunset so it was quite dark, but I love the mood it created with the photos! Vibrant Table baked up some very delicious food while friends and family gathered for the Samoan Siva dance. This dance has been a part of David’s family for generations and was very fun to photograph. So incredible to watch and see Grandma literally pass this graceful dance from generation to generation. Needless to say their wedding was full of true joy and exuberant love and I’m so honored to have been the one to document it! Mia and Chris and I met at a wine-tasting event WAY back in the day right around the time when Chris proposed! We photographed their apple-orchard inspired engagement session back in 2012 and had a blast together. Since then so much has happened, marriage, houses, careers (Mia is the manager at the Pearl Anthropologie!) and Mia and Chris welcomed their sweet baby girl Ceci into this wonderful world! Was so honored to photograph their sweet family along with their pups at their stylish home in NE Portland. I especially loved the Jonathan Adler couch! (Yes please) and Ceci’s hip and bright nursery. Their older pup passed very soon after these photos were taken so I’m very humbled to have photographed that sweet pup. So much love for this kind, stylish and creative family! Elegant, Timeless, Classic and Fun!!! Loved getting to know this couple and the fun adventure we had during their fun engagement session. The lovely Elizabeth with Bridal Bliss coordinated and Blum Florals created the AMAZING florals with gorgeous and unique details (loved the blueberry gold dish centerpieces and the hand-painted masterpiece cake by Dreamcakes) and a fun party. The sweet ceremony took place at the historic First Presbyterian Church in downtown Portland where you could actually feel the love within the rafters! The classic and beyond stunning Governor Ballroom at the Sentinel Hotel was breathtaking. As Michael twirled Ande into the night, the incredible band Precious Byrd played on and kept the party going. As you can tell this was an evening to remember and we made some magic art. Loved this day and thank you Ande and Michael for trusting me with documenting your true love story! What a night! The Roelke and Coddington families all met up at the beautiful Kruger’s farm on Sauvies Island for their family photos! Rachel is a hilarious and wonderful woman, friend, mama and incredible wedding and conference coordinator and I was honored to document her rad family. The grandparents and aunt and uncle joined in the fun while we hung around the farm too! While photographing beneath the gorgeous oak tree there, a miniature horse was walking by with it’s owner and I jumped at the opportunity to photograph little man Everett with the horses. SO COOL. Needless to say I had a blast with this fun, stylish and smart family and I love that they created some awesome custom canvases for their home! Have you heard the news about the fall mini-sessions? Here’s more info about the family photos in Portland, Bend and Wilsonville this autumn, and I would love to document your family soon!